B-12 is a water-soluble vitamin that appears naturally in many animal-based foods. Vitamin B-12 controls your body’s ability to produce red blood cells and synthesize DNA, and it also impacts your neurological functioning. You don’t need much vitamin B-12 for your body to function properly -- the recommended dietary allowance for an adult is 2.4 micrograms. If you are vitamin B-12 deficient, you will need significantly more than the RDA to even out your levels of B-12. How quickly B-12 works depends on several factors including your level of B-12 deficiency and what type of supplement you take. Injections are the most popular way to treat vitamin B-12 deficiency. The B-12, usually in doses of 1,000 micrograms, is injected directly into your muscles, eliminating any possible absorption barriers. Treatment schedules can vary, but most injections are done over a three-month period on days one, three, seven, 10, 14, 21, 30, 60 and 90. For some people, the three-month period will suffice, but people who are severely B-12 deficient will have to continue with their B-12 shots on a monthly basis. People who are squeamish about injections can opt for oral B-12 supplements. An oral B-12 supplements treatment often starts with higher dosages, such as 2,000 micrograms daily, which is later reduced to 1,000 micrograms daily. Depending on your individual case of B-12 deficiency, your doctor may then lower your recommended dose to 1,000 mcg per week or 1,000 micrograms per month. Depending on your reaction to the oral B-12 supplements, your doctor may eventually remove you from B-12 completely. As with the injections, a timeline for reduced dosage varies based on your reaction to the B-12 supplement. If you are mildly B-12 deficient, your doctor may recommend using a multivitamin instead of a B-12 supplement. A multivitamin will provide you with a lower dose of B-12 that will still be strong enough to level out your vitamin B-12 requirements. There is no need to worry about overdosing on vitamin B-12, as excessive B-12 does not cause any adverse physical effects. There are medications, however, that can impede your body’s ability to process a B-12 supplement. Metformin, often prescribed for diabetes, and chloramphenicol, a bacteriostatic antibiotic, will affect your ability to absorb vitamin B-12. Other medications such as omeprazole, lansoprazole, cimetidine, famotidine and ranitidine, all of which treat peptic ulcer disease, will also interfere with your levels of B-12. Consult your doctor for information on how to raise or maintain your levels of vitamin B-12 if you are using these medications. 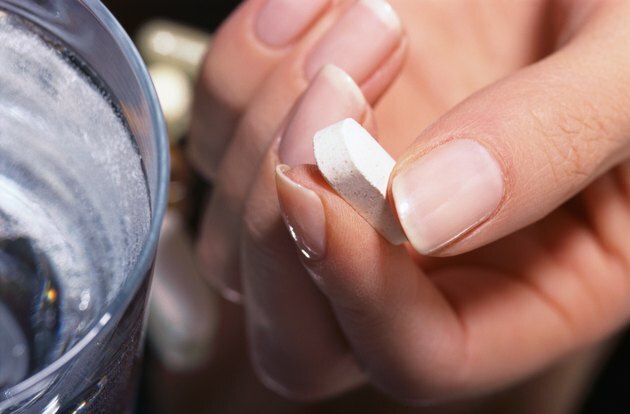 Are There Any Side Effects of Taking a B12 1000 Supplement Daily?